Hanging report covers feature Presstex that protects documents from the elements and hooks that allow easy file cabinet storage. Retractable hooks are designed for use in a file drawer or to stand upright in a bookshelf. Design includes color coded Tyvek reinforced hinge and pop out center tab. Steel prong fastener holds up to 2 of paper. 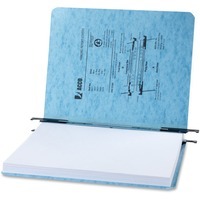 20 point Presstex covers are durable and moisture resistant.